Republicans get $1.375 Billion for border ‘barriers’ instead of Trump’s $5.7 billion for concrete and steel walls…. Democrats THINK the got lowered limits on the number of people ICE can detain at anyone time…. They have been under pressure to curtail ICE raids within the country…. The agreement funds the agencies and departments whose funding was stopped during the 35 day Trump border Wall Government shutdown last month…. “We’ve had a good evening. We’ve reached an agreement in principle between us on the Homeland Security and the other six bills,” Sen. Richard Shelby (R-Ala.) told reporters. Shelby announced the deal alongside Sen. Patrick Leahy (D-Vt.) and Reps. Nita Lowey (D-N.Y.) and Kay Granger (R-Texas)—the top members of the Senate and House Appropriations Committee. The breakthrough came after the core four negotiators met three times on Monday night in a last-ditch effort to get a deal after talks appeared to unravel over the weekend with only days to prevent a partial government shutdown. Negotiators refused to discuss the particulars of the deal with staff expected to work frantically to release the legislation as early as Tuesday. 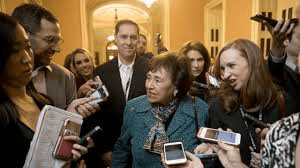 Lowey said she hopes for the bill, which she called a “good product,” to be released on Wednesday. A congressional source told The Hill that the bill will include $1.375 billion for physical barriers, the same amount included in the 2018 fiscal year bill. The tentative agreement, according to the source, also specifically prohibits the use of a concrete wall. But, senior Congressional aides separately noted that it will fund approximately 55 new miles of barriers along the U.S.-Mexico border in the Rio Grande Valley sector. If negotiators are able to hold an agreement together, it would mark a dramatic U-turn from earlier Monday when both sides were still divided on two key issues: funding for physical barriers along the U.S.-Mexico border and a snag on Immigration and Customs Enforcement (ICE) detention beds. Lawmakers refused to discuss how they resolved the ICE fight, after Democrats proposed a cap on the number of ICE detention beds, arguing it would force the Trump administration to focus on “serious criminals,” and that numbers were in line with those from the Obama administration. “We worked it out in principle. We think it’s going to work,” Shelby said. Democrats appear to have dropped their demand to cap the number of ICE detention beds in the interior of the country, away from the border, at 16,500. But in a sign of the potential hurdles to the agreement, there seemed to be mixed signals on other details of the ICE provisions on Monday night….